The swagger and scale of the public spaces at The Principal Manchester are found in equal measure in the bedrooms and suites, from double-height windows to wood panelling to original tiling. No two rooms are quite the same, but the features mainly derive from their location: Alfred Waterhouse’s 19th-century original building, Paul Waterhouse’s clock tower extension, or the block built in the 1930’s. All of them were completely refurbished in 2016 as part of the multi-million pound launch of The Principal Manchester. The Principal is a truly amazing destination for your team building activities. The Refuge is curated by DJs-turned-restaurateurs, Luke Cowdrey and Justin Crawford of the award-winning Volta. Public Bar – stay all day! Dining Room – globally inspired small plates and sharing dishes. 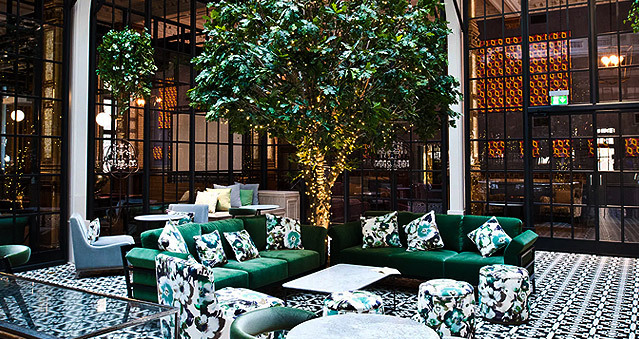 Garden – an elegant spot for G&Ts and snacks. Den – perfect for parties, team building events, there’s a private bar and plenty of games. Ideal for The Killing, Around the World, Awakening the Dead, Stocks in the City, Mixology, The Ultimate Team Build, Get in the Zone, Real Life Clu’Doo, Escape the Box, No Ordinary Quiz plus many more. Location: The nearest railway station—Manchester Oxford Road—is directly opposite the hotel and serves destinations in South Manchester and the North of England. Manchester Piccadilly is the main station for the city and is a 10 minute walk from the hotel (or 5 minutes by taxi), serving London, Edinburgh, Cardiff, and more. The Principal is 3 miles from the M62 to the south.